The passengers travelling in the train complain that when they enter the train NO- 2411 AC Arunachal Express find unhygienic. 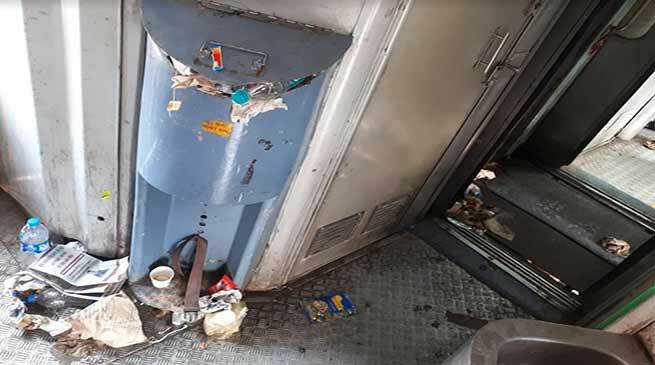 Garbage and waste remain as it is on the passages inside the bogies, and near the toilet. There is no one to derive it away or no one to clean the train. The toilets seems to in bad shape while dustbin available between two bogies are full and is not cleared by anyone neither by the train authority nor the outsourcing people available in the train. The asked the hawkers available in Train from Kwality Caters, said that cleaning is not our responsibility and we are only to sell the eatable items to the passengers as per their demand on payment. It is the responsibility of the passengers they throw the waste garbage either to dustbin kept in the train or to the rail lines. The persons from Raill Coach Attendants from Vibgyor Info Pvt Limited, Lucknow said that we are authorised only to carry out the work for providing the clothing and other to the passengers and its cleaning and distribution. The passengers travelling in this train complaint that ” the services in this train are not upto the mark in compare to other AC train, the seats are never full and time table is not properly maintained”. On My 14 the train reached late for more than 8 hours and its is the daily affairs though it began in right time from Naharlagun as per schedules on 12th May other claimed. One passengers also complaint that ” door lock and bolts in bathrooms do not properly working, and the older people have to face problem . Smoking and other tobacco products are also used by the passengers which are not checked by any security and authority. One old lady complain of smoking by gents in space between two bogies and said there is no one to take action those and hardly see security personnel and TTE moving in the train to check normal affairs of the train even if all is well. While talking to Arunachal24 few passengers said that ‘they made their protest with the TTE available in the Train on May 14 in between Lucknow to Delhi and appeal him to inform the authority about poor facility in the train. Few passengers allege that the railway charges extra money from passengers in the name of special train in compare to AC Arunachal Express but the facility is even lower than the normal passenger train’. When contacted Union Minister of state for Home Affairs Kiren Rijiju said that he will inform the Railway authority to maintain the cleanness in the train as well as other facilities for the convenient of the passengers. He however appeal that Railway is our property and we should also help in maintaining the train neat and clean.